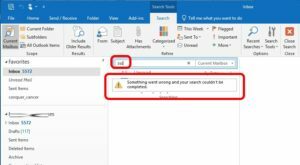 If your Outlook returns a yellow box saying “Something went wrong and your search couldn’t be completed” the most likely issue is your Windows Search Service is damaged. 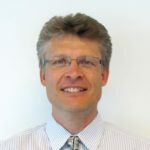 Click the START button and type SERVICES.MSC to start the Services management console and see if the WINDOWS SEARCH service is not running. 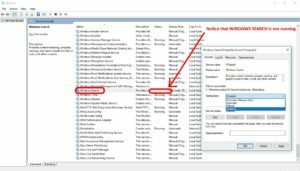 To fix this problem you should RIGHT click on the WINDOWS SEARCH service and select START. 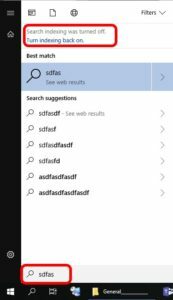 In the unlikely event that works, you are done, but most likely you will need to flush an rebuild the Windows Search service. The fastest way to solve this is to delete the Windows Search Service data and have it rebuild from scratch. As this point all search indexes have been removed and will take time to rebuild. Outlook, in particular, will only rebuild it’s index when it is running so make sure you leave Outlook up for a few hours. You can tell it is working because when you do a search in Outlook it will have a ‘we’re indexing right now, try again later’ type message and not the yellow bar ‘Something Went Wrong…’ message. Or you could go to search index and click rebuild index………..
‘Does not help’, does not help your case. What are you seeing and what have you done to resolve it? I have successfully used the process documented here on several occasions so I know it works.